These electron microscope images show fine marine sediments made up of mineral and plant particles. The top image shows quartz grains composed of the mineral silica. Because quartz is very resistant to chemical weathering, it is common in beach and ocean sands. 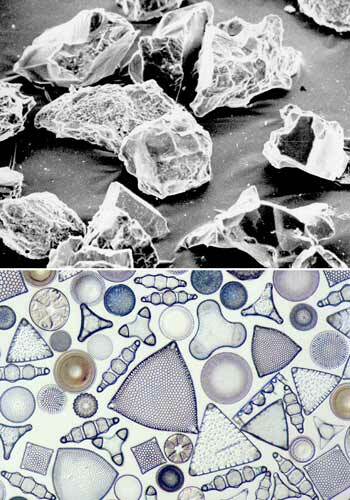 The lower image shows sediment made of the remains of diatoms – a common plant plankton also composed of silica. In general, inorganic sediments are more common close to land, and organic sediments more common offshore.